We know how to RELAX! Are you ready for the hustle and bustle of the holidays? Take a little time for yourself and let us help you! We have some amazing specials throughout December and we encourage you to treat yourself. Oh, and there is a little fun mixed in there too! Experience an exceptional anti-aging facial that incorporates a high performance, technical treatment. This facial contains 20 key ingredients to act on all signs of aging concerns: lines/wrinkles, collagen and elastin, nourishment and dark spots. Receive a complimentary Gift Card for a Mini Facial valued at $40 to give to a friend or loved one who has never had a facial at The Follicle before. Take some time for you in December. Luxuriate in the warmth and scents of a Hot Stone Massage. 20% off Balayage or a Pravana Smoothing treatment with Parvin. The Pravana Perfection Smoothout Treatment promises to safely transform course, frizzy hair to smooth and shiny hair with semi-permanent results lasting 8-12 weeks. Did you know that Balayage is a French colouring technique that was developed in the 1970s? 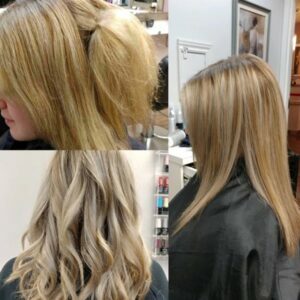 It is a freehand technique where the colour is applied by hand rather than using the traditional foiling or cap highlighting techniques. Balayage can be used in even the shortest pixie crop however the best results is occur in shoulder length (or longer) hair. We love to have fun this time of year and wear our ugly Christmas sweaters. We look forward to having you, our valued clients, vote for your favourite. For two days we will be sporting our “best” and we need your help deciding who the winner is. Pick the winner and be entered into a draw for a chance to win a gift basket with free products! For these 2 days, we will have extra ornaments on our Christmas tree. For every service or product purchase you may pick an ornament for instant discounts! Sign up for emails and you won’t ever miss out on special offers!